Possible Asbestos-Containing Flooring ID Requests for the U.K.
POST a QUESTION or READ FAQs about how to identify asbestos-containing flooring materials and what to do when asbestos-containing floor tiles or sheet flooring are found in a building. This article series provides flooring identification requests & photographs & discussion of UK flooring tiles or cottage tiles that may contain asbestos as well as a photo example of non-asbestos flooring. In the U.K. buildings constructed or renovated before 2000 may have included asbestos-containing products such as drywall, plasterboard, pipe insulation, or vinyl or asphalt-based floor tile or sheet flooring. According to the U.K.'s Health and Safety Executive, Large amounts of asbestos were used in new and refurbished buildings before 2000. Blue (crocidolite) and brown (amosite) asbestos were banned by law in 1985. Manufacture and supply of all asbestos was banned by the end of 1999. Existing asbestos articles can continue in use until they reach the end of their service life. (HSE 2017 cited below). Note that even if asbestos-containing material such as asphalt or vinyl-asbestos flooring is present in your building, that does not necessarily mean that you must or even should remove it. The least-risky course for flooring in good condition is to leave it alone, in place, covering it over with new material. Asbestos is safe and legal to remain in homes or public buildings as long as the asbestos materials are in good condition and the asbestos can not be released into the air. ASBESTOS FLOOR TILE IDENTIFICATION 1950's or LATER in the U.K.
U.K. ADVICE for POSSIBLE-ASBESTOS FLOORING - what if removal is necessary? Shown here: asphalt and vinyl based floor tiles and sheet flooring in U.K. homes. For some of these flooring photos we can confirm that the material does or does not contain asbestos. 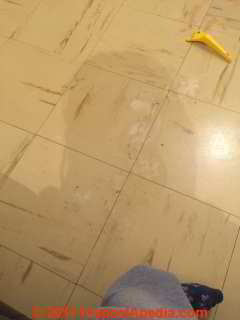 Other flooring images are shown as possibly-containing asbestos pending lab test results or other information that we post here. According to the U.K.'s Health and Safety Executive, Large amounts of asbestos were used in new and refurbished buildings before 2000. Blue (crocidolite) and brown (amosite) asbestos were banned by law in 1985. I found these tiles under my carpet when we took it up. I started cleaning them and the top layer came off. Do you think these are asbestos ? My house was built in 1987 in Gloucester UK. If you do what would be your advice on what to do next. I was about to have a new carpet and underlay put down first thing tomorrow ? 1. the fact that crocidolite asbestos was banned in the UK two years before your floor was installed (that is 1985). 2. the more-common form of asbestos used in flooring products was chrysotile [not crocidolite as we mis-typed previously], and some amosite. 3. For "new" vinyl floor tiles in the UK to have been sold in an asbestos-containing version they'd have to have been "new old stock" that someone kept around from having been manufactured before 1985, OR flooring imported from elsewhere. The UK Asbestos (Prohibitions) (Amendment) regulations came into force on November 24, 1999 (The E.U. followed in 2004). Chrysotile (white asbestos) had been permitted in the UK. Amosite and crocidolite forms of asbestos were banned in in the U.K. in 1985. You are correct that Chrysotile asbestos (white asbestos) is considered less dangerous than it's cousins Amosite asbestos (brown asbestos) and Crocidolite (blue asbestos) but it would be a mistake to treate white chrysotile asbestos in a cavalier mannner. White chrysotile asbestos is considered a major health hazard by the World Health Organization and is so named also by EU standards. In the UK a voluntary ban on blue asbestos (crocidolite) went into effect in 1967. In 1985 the UK banned the import and use of both blue asbestos (crocidolite) and brown asbestos (amosite). In 1999 the use of all asbestos was banned in Britain. However white asbestos (chrysotile asbestos) continues to be used in some countries, leading to the possibility that imported products leaking past the asbestos ban might contain asbestos in that form. Britain was indeed at one time the world’s largest importer of amosite or brown asbestos, leading to a common view that amosite asbestos is responsible for a particularly high rate of mesothelioma deaths in the U.K.
Wash the present floor and let that dry. Install new carpeting over the floor. Question: identify floor tiles that are lifting - do these contain asbestos? I'm really hoping you can help me identify some floor tiles that I have been lifting up over the weekend - asbestos exposure didn't even occur to me until after I had done this and i am now panicking about it. The tiles broke up quite easily and were very brittle. My property was built in 1987/88, the size of the tiles is 300x300mm. This to me suggests that it is unlikely that they do contain asbestos but a quick search on the internet and i have found very similar looking tiles stating that these may contain asbestos (albeit they appear to be the older 9"x9" size). Above in the large photo is an Armstrong floor tile example whose dark brown tiles resemble your example. The small photo is an Armstrong Excelon tile product from the 1960's. Older than your flooring. These are U.S. products described at ASBESTOS FLOOR TILE ID REQUESTS 1950's or EARLIER. Keep in mind that variations in how a floor photograph is made can affect the apparent colour and pattern and thus can make finding your floor tile among our examples a bit tricky. I think the floor above is probably Cayuga Brown #715 by Armstrong. I also show a small image of Kasha Taupe sold in the U.S. from 1960 up to about 1969. I am surprised by the age of building that you report as I think you may find a close match at - ARMSTRONG EXCELON VINYL ASBESTOS FLOOR TILES - among the "standard" vinyl asbestos floor tiles - the reddish brown floor in your photo was a popular pattern sold over many years beginning in the mid 1950's. Also you can look in the ID-library of asbestos flooring beginning at ASBESTOS FLOOR TILE IDENTIFICATION​ organized by year and manufacturer where there are similar ones. There are so many manufactures and floor tile patterns, types, sizes, and colors over many decades that just looking through catalogs organized by even color or pattern can daunting task. One can narrow the question by a reasonable guess about the age of the flooring. At the very least, narrow this by the age of the building. We can narrow the guess further if we know when a building was renovated, or by observing the type of tile adhesive or mastic used. WIth that data we can choose among our floor tile or sheet flooring photo ID guides that are organized by year beginning at the link I gave above. PHOTOS: You are welcome to send us photos of flooring, and where loose tiles, markings, or packaging are available I'd want to see the back side of flooring and all sides of packaging and labels. Tile dimensions and thickness are also useful. Our email link is at the CONTACT link at the top or bottom of any InspectApedia.com page. Many thanks for your response - I have since has these tiles tested at a lab and they have come back as negative for any trace of asbestos. I also managed to contact a friend who used to live in the same street who also had these tiles replaced and they too confirmed they were asbestos free - i'm relieved to have discovered this! Watch out: other examples of this floor tile pattern widely installed in North America up to the early 1980's have been confirmed as an asbestos-containing material - Ed. Which forms of asbestos are most-common in U.K. Asphalt or Vinyl Asbestos Floor Tiles? On the page ASBESTOS FLOOR TILE IDENTIFICATION 1950's or LATER in the U.K some way down, under the heading "Vinyl Floor tiles in the UK after 1985", it states that "2. the more-common form of asbestos used in flooring products was crocidolite, and some amosite." This contradicts any info I can find on the UK HSE, such as ASBESTOS PRODUCTS in the UK, LIST [PDF] and also ASBESTOS: The SURVEY GUIDE [PDF] which only ever mentions chrysotile (white asbestos) in flooring products. Could crocidolite possibly be a typo here? I very much appreciate your careful reading and questioning of our reference to crocidolite asbestos in asphalt or vinyl tile flooring. You are right that I appear to have mis-typed chrysotile as crocidolite - and below report on varous sources making clear the typical composition of and types of asbestos used in floor tiles, both asphalt-based and vinyl-based. You are absolutely right that most asphalt-asbestos floor tile and vinyl-asbestos floor tile contained principally chrysotile asbestos with some amosite asbestos. My citations below of Rosato who was there at the time are useful for percentage figures: at least 25% asbestos, of which both long fibres for strength and shorts for filler were used in asbestos-containing flooring. Chrysotile had been the only type of asbestos permitted in the UK since amosite and crocidolite were banned in 1985. But crocidolite was used in particularly in cement-asbestos products, in ceiling tiles, in fire-resistant spray-on coatings (cited below) and other products. Floor tiles and sheet flooring that used asbestos are not asbestos-cement products and more commonly that flooring contained chrysotile and amosite asbestos. HSE considers that the risk of exposure to airborne asbestos fibres is lower in asbestos cement products compared with some other asbestos containing products due to: ... - the high use of chrysotile asbestos compared to amosite and crocidolite asbestos. I read that to mean that crocidolite was indeed in UK products prior to 1985. It was in the early 1980's that world attention began to focus more acutely on asbestos hazards in flooring. In my OPINION those hazards are much less than the asbstos hazards from more-friable asbestos-containing materials, until there is a messy demolition or until someone grinds, saws, chops, or sands asbestos-containing floor tiles including both older asphalt-asbestos flooring and vinyl asbestos flooring that was popularized later. Asbestos Regulations in the E.U. There are common EU rules determining provisions concerning asbestos. The provisions apply to all activities where there is a risk that an employee will be exposed to the dust which contains asbestos. To work with asbestos, you need a special permit from the Swedish Work Environment Authority, you also need training as well as a medical examination certificate. This heavily illustrated publication replaces and expands on MDHS100, Surveying, sampling and assessment of asbestos-containing materials. It is aimed at people carrying out asbestos surveys and people with specific responsibilities for managing asbestos in non-domestic premises under the Control of Asbestos Regulations 2012. Also see our more-complete ASBESTOS LIST of PRODUCTS drawn from multiple sources. Burdett, G. J., and S. A. M. T. Jaffrey. "Airborne asbestos concentrations in buildings." The Annals of occupational hygiene 30, no. 2 (1986): 185-199. Airborne concentrations of asbestos and other fibres were measured in 39 buildings containing asbestos materials used in their construction or present in warm-air heating systems and in four buildings without asbestos materials. Samples were collected onto membrane filters and analysed using both phase contrast optical microscopy (PCM) and transmission electron microscopy (TEM). Of the 235 samples analysed by PCM, 13% gave fibre concentrations above 0.01 fibres per millilitre (f ml −1 ); no sample exceeded 0.075 f ml −1 . However, subsequent TEM analysis showed that most of the fibres were not asbestos and at only one site did the > 5 μm long fibre concentration exceed 0.001 asbestos f ml −1 . All sizes of asbestos fibres were also analysed in the TEM at × 17 000 magnification. Only 20% of the buildings had asbestos fibre concentrations above the limit of quantification (>4 fibres counted) and often only a few chrysotile fibrils were detected. Mass calculations based on the fibre size showed that the average concentration of chrysotile was < 1 ng m −3 at all sites, and only when large amosite fibres were present was the 1 ng m −3 level exceeded. Hendry, N. W. "The geology, occurrences, and major uses of abestos." Annals of the New York Academy of Sciences 132, no. 1 (1965): 12-21. Excerpt: Chrysotile had been the only type of asbestos permitted in the UK since amosite and crocidolite were banned in 1985. Lange, John H. "Asbestos-containing floor tile and mastic abatement: is there enough exposure to cause asbestos-related disease?." Indoor and Built Environment 14, no. 1 (2005): 83-88. Chrysotile asbestos has been reported as a constituent of both floor tiles and mastic. In consequence, asbestos-containing floor tiles and mastic have been identified by regulatory agencies as hazardous materials. The reason for this categorisation is the suggested potential for these materials to cause asbestos-related diseases and as a result special handling has been prescribed. However, studies have reported that little airborne asbestos exposure occurs during abatement of these materials. Evaluation of exposure levels in comparison with levels with the potential of disease causation suggests that there is little likelihood of workers handling or removing these materials developing an asbestos-related disease. When the maximum exposure level of 0.02f·ml−1 (0.8f·ml−1 year) found during studies is considered over a 40-year period and evaluated with epidemiological data, the risk of mesothelioma, asbestosis and lung cancer may be estimated to that reported for background levels. From a practical point of view this represents zero risk. Study results suggest that floor tile and mastic are not likely responsible agents for asbestos disease in either abatement or other workers associated with these products. Mckenna, Alan. THE LEGAL OUTLOOK IN 2012 FOR ASBESTOS CLAIMANTS [PDF] British Asbestos Newsletter 85 (2012). Sebastien, P., J. Bignon, and M. Martin. "Indoor airborne asbestos pollution: from the ceiling and the floor." Science 216, no. 4553 (1982): 1410-1412. Electron microscopic measurements of the concentrations of airborne asbestos were carried out inside and outside an office building having ceilings sprayed with a crocidolite-containing material and floors covered with vinyl-chrysotile tiles. Under normal conditions in this building, constructed 10 years ago, the two asbestos-containing materials released fibers into the air. This is the first measurement of elevated (up to 170 nanograms per cubic meter) concentrations of indoor airborne asbestos associated with the weathering of asbestos floor tiles during their service life. Asbestos flooring is used in a large number of buildings and represents the third largest use of asbestos fibers in the United States and in Europe, ranking after roofing and asbestos-cement pipe. Tossavainen, Antti. "Global use of asbestos and the incidence of mesothelioma." International journal of occupational and environmental health 10, no. 1 (2004): 22-25. In Western Europe, Scandinavia, North America, and Australia the manufacture and use of asbestos products peaked in the 1970s. Current incidences of mesothelioma range from 14 to 35 cases/million/year in 11 industrialized countries that had used asbestos 2.0 to 5.5 kg/capita/year about 25 years earlier. A significant linear correlation (r = 0.80, p 0.01) exists between the two variables. Accordingly, about 170 tons of produced and consumed asbestos will cause at least one death from mesothelioma, most often as a consequence of occupational exposure. The importation, supply and use of blue and brown asbestos were made illegal in the UK only in 1985. Chrysotile was banned only 10 years ago (in 1999), with the exception of a few specialised uses. However, asbestos materials have been used extensively for more than a century, leaving many thousands of tons of asbestos in buildings at the present time. Asbestos ‘is estimated to be present in 90% of all public sector housing’ (CSE, 2005). Waldman, Linda. "'Through no fault of your own': asbestos diseases in South Africa and the UK." (2008). Both of your source citations are credible, being in the UK HSE, though possibly incomplete. cites three asbestos forms but as you noted, does not apply the "blue" (crocidolite) to flooring. I'm not sure that document is complete. In general, however, unless there is evidence to show otherwise, the asbestos type should be assumed to be crocidolite asbestos. Appendix 2: ACMs in buildings listed in order of ease of fibre releaseable of products and asbestos types simply does not include flooring. Probably because the ease of fibre release is so low. 99 Some materials, like textured plasters, paints and vinyl floor tiles, may contain very fine dispersed chrysotile asbestos which may not be seen by eye or with a magnifying glass, and these materials (if old) will have to be presumed to contain asbestos unless they are sampled and carefully analysed by a competent laboratory. As imported materials may have contained chrysotile asbestos until 1999 and laboratories often miss the fine asbestos, some additional checks may be necessary with these types of materials. Other useful characteristics (eg surface texture, sound when knocked, warmth to touch, surface hardness/deformation with a probe) may also be used by experienced surveyors to help compare the material with other materials they have previously encountered and had samples identified. Unless the surveyor is convinced that there is adequate evidence to conclude that the material is asbestos-free (eg plaster, plasterboard, wood etc), a presumption or strong presumption should be made that it is an ACM. contamination from smooth, non-absorbent surfaces and equipment. Asbestos essentials task sheets tell employers, managers and sole traders what to do when they need to work on or near ACMs. They will help you to decide what category of asbestos work it is and how to plan the work safely. Higher-risk work with ACMs, including sprayed coatings, loose asbestos, lagging, insulation and jobs involving asbestos insulating board (AIB) – apart from some very limited-duration works to AIB – will require an HSE-licensed contractor. The task sheets cover work that does not need a licence if carried out as the sheets describe. Each sheet describes what equipment is required for a particular task and covers the action needed to reduce exposure to an adequate level. minimise asbestos fibres released during a task, and how to use it to clean contaminated items. Watch out: do not use a conventaional vacuum cleaner, even one that sports a HEPA filter. These devices are not adequate for asbestos cleanup, and using one can significantly increase the level of airborne asbestos exposure in your building. WETTING ASBESTOS MATERIALS [PDF] U.K. HSE (2017) This sheet explains why you must wet asbestos materials before working on them, and how to do this. For buildings with floor tiles or sheet flooring that can be assumed to have been installed in the U.K. before 1986 it would be prudent to treat the flooring as "PACM" or "Presumed Asbestos Containing Material". That does not mean we should panic nor undertake an expensive and dangerous asbestos removal project. Generally the safest approach is to leave such flooring alone and to cover it over with a coating or with another layer of flooring. IF you are faced with a requirement for demolition and if you are uncertain about the flooring's asbestos content and cannot identify it through our guides, then you have a sample tested. Watch out: do not assume that asphalt-asbestos flooring or vinyl-asbestos flooring in your building is the only asbestos hazard nor that it is the most dangerous asbestos source. Other asbestos-containing materials in your building may be more friable, more-easily releasing asbestos fibres into the building air, and thus more dangerous. The location and condition of the material is important too. See ASBESTOS LIST of PRODUCTS for an extensive list of the forms in which asbestos was used and for asbestos-containing products or materials likely to be found in or on buildings. 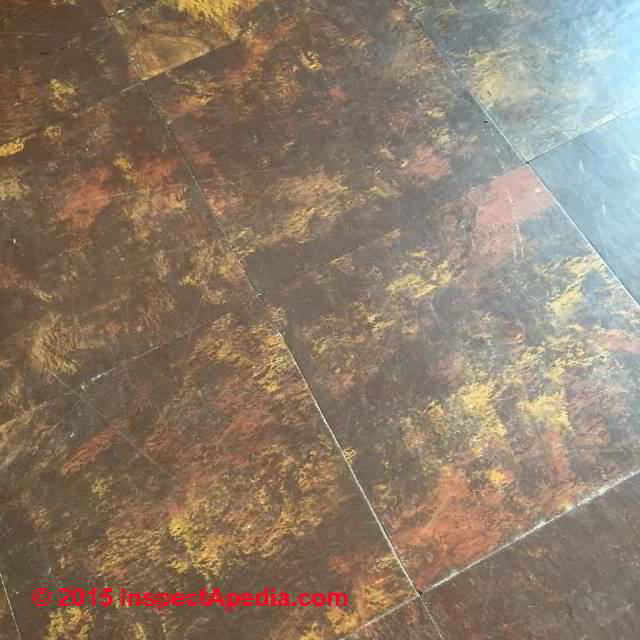 Continue reading at ASBESTOS FLOOR TILE PHOTO ID REQUESTS - home, or select a topic from closely-related articles below, or see our complete INDEX to RELATED ARTICLES below. ASBESTOS FLOOR TILE IDENTIFICATION 1950's or LATER in the U.K. at InspectApedia.com - online encyclopedia of building & environmental inspection, testing, diagnosis, repair, & problem prevention advice. Questions & answers or comments about how to identify asbestos-containing flooring materials and what to do when asbestos-containing floor tiles or sheet flooring are found in a building. Resilient Floor Covering Institute, 1030 15th St. NW, suite 350, Washington D.C.
Asbestos Regulations: State asbestos regulatory agencies (5 pp, 17k) (original source http://www.epa.gov/asbestos/pubs/statecontactsapril2009.pdf ) for information on how to find an accredited asbestos professional. Asbestos products and their history and use in various building materials such as asphalt and vinyl flooring includes discussion which draws on ASBESTOS, ITS INDUSTRIAL APPLICATIONS, ROSATO 1959, D.V. Rosato, engineering consultant, Newton, MA, Reinhold Publishing, 1959 Library of Congress Catalog Card No. : 59-12535 (out of print). How to Develop and Maintain a Building Asbestos Operations and Maintenance (O&M) Program, This information is designed to assist building owners and managers in understanding how to develop and maintain an operations and maintenance program for asbestos-containing materials in their buildings. Asbestos Identification, Walter C.McCrone, McCrone Research Institute, Chicago, IL.1987 ISBN 0-904962-11-3. Dr. McCrone literally "wrote the book" on asbestos identification procedures which formed the basis for current work by asbestos identification laboratories. Asbestos products and their history and use in various building materials such as asphalt and vinyl flooring includes discussion which draws on ASBESTOS, ITS INDUSTRIAL APPLICATIONS, ROSATO 1959, D.V. Rosato, engineering consultant, Newton, MA, Reinhold Publishing, 1959 Library of Congress Catalog Card No. : 59-12535 (out of print, text and images available at InspectAPedia.com). Dust from the World Trade Center collapse following the 9/11/01 attack: the lower floors of this building contained spray-on fire-proofing asbestos materials. Asbestos Information Links: Asbestos Detection, Testing, Recognition, Hazards, Field Photos, and Information Sources, including health-related links such as legal services and information about mesothelioma and other cancers.